Should I keep buying gift cards for the discount? I work upstairs from a location of Lee’s Deli, so I go there a lot for lunch. They have a deal where if you pay $50 for a gift card, they’ll load it with $55 of value. Sounds like a good idea, right? But on the other hand, I’m not going to stay at this job forever, so at some point I’m going to end up stuck with value on one of my cards. Should I make a habit of buying these cards? On the one hand, for every card I buy I gain $5 in value. On the other hand, I expect the card that I have when I will no longer need such cards will have half of its $55 value left when I leave, costing me $27.50. So if I expect to stick around long enough that I’ll go through five and a half gift cards – spending $302.50 – then I should keep buying the cards. – when I do leave my job I won’t just walk out the door; I’ll give some notice, like you do. So I can decide to use up the card. – if worse comes to worse, I can sell the card to someone else in the office, at least at face value – I’m not the only one who buys these cards. Nate Silver on domestic surveillance creating a divide in the 2016 primaries., and later on Lebron’s odds of catching Jordan and winning six NBA championships. Kieran Healy uses metadata to find Paul Revere. When not knowing math can cost you $15,000, from Who wants to be a millionaire. Chelluri Sastri for Scientific American on Continuous and discrete as it applies to the less/fewer distinction. Alex Krawchick of SAS talks with Nate Silver. Roots of a base tiling. Nautilus is a new science magazine that is currently doing an issue on uncertainty; this article by Stephen Cass is on technologies that rely on randomness. Richard Green has written on Google Plus about the Cookie Monster problem. Amazon has yellow books on sale. Where does the 51st star go? See also this Slate article from a few years back. yhat, a predictive modeling company, writes a beer recommendation system in R.
The documentation for R’s sample function says that it uses Walker’s alias method, which I had not heard of. In googling around I found Keith Schwarz’ exposition of methods for sampling from a discrete distribution. Folding the future: from origami to engineering. Pascal van Hentreyck is offering a course on discrete optimization at Coursera. Even if you don’t take the class, you should watch the trailer video. 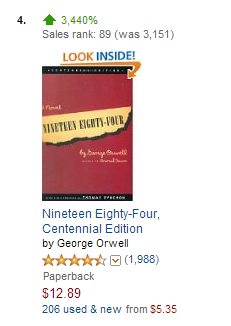 Will Oremus at Slate writes that “Sales of George Orwell’s 1984 Are Up 5,000 Percent on Amazon”. But the Amazon Movers and Shakers page says that it displays “Our bigger gainers in sales rank overs the past 24 hours. Updated hourly.” That is, they’re looking at sales rank, not raw sales. Can we really conclude from that 3,440% number in the screenshot that sales have gone up by a factor of 35? Perhaps we can, if the sales follow Zipf’s law – that is, if the sales of the kth-highest-ranking item are 1/k the sales of the highest-ranking item. So if the sales of the highest-ranking item are S, then sales have gone up from S/3151 to S/89 – a percentage rise of (3151-89)/89, or 3440%. This formula agrees with the percentage results that Amazon states for all the books on the Movers and Shakers page. Of course this doesn’t mean that Amazon’s sales are actually Zipfian – it’s much more likely that they want a convenient formula that gives reasonable-looking rankings. But if they are, then these percentages are not too far form the truth. My PhD advisor, Robin Pemantle, has published a book. It’s Analytic Combinatorics in Several Variables, co-authored with Mark Wilson. Analytic Combinatorics, by Philippe Flajolet. As Flajolet’s book is to univariate analytic combinatorics what Pemantle-Wilson promises to be to multivariate analytic combinatorics, no surprise there. Inferno by Dan Brown. Not the computer scientist dan brown, the author. the probable existence of an (aspiring?) analytic combinatorialist out there who reads Dan Brown. that Amazon’s “customers who have viewed this item have also viewed” is pretty close to being what it says it is. In particular, there isn’t some prior in there that assumes that people who buy Pemantle-Wilson are likely to buy other math books and steers them in that direction.